What is the political economy of Facebook? How could such an institution be nationalized? Could it be made a global social property? Please respond in any media format, WordPress FB or Twitter. A correct understanding of the Democrat and Republican parties and their function in the mechanism of the “two party system” is to see them as structural institutions of the state. In part because much political theory is viewed through the lens of the European experience especially that of France, Russia and the British Parliamentary model, the understanding of the evolution of two party system in the United States has been flawed. 20th century movements and political organizations operating outside of the two party system found themselves locked in a trap. They remained small fractured organizations with little honest hope of gaining mass influence. The ruling class and the political caste that serves them are not so naive about this system. It is common knowledge that the major corporations and big ruling class donors play between these two institutions funding them each intermittently–quite often concurrently–and that their armies of lobbyists and professional influencers are enmeshed within both institutions. The tactical options are presented as a sort of triage of bad choices: operate outside of the two parties in a system structured to marginalize non-conformity and challenges to power, choose to work within the Democratic structure, choose to work within the Republican structure. The apolitical partisanship that is fostered by these institutions serves a function not so different from that of racism and xenophobia in terms of the insidious way in which it divides the mass of the society pitting working people against one another and setting up cultural litmus tests as barriers to common understanding and human solidarity. We are recruited by social media and other interventions to play the role of pawns in the factional conflicts and electoral gamesmanship between elements of the American plutocracy. So, why not call the bluff of this whole system? Why would it not be possible to consider an all of the above approach to the triage? Why not form an electoral front with sufficient cohesion to run independently where possible and enter the primary system and legislative races of either party formation without at any point sacrificing principles or political identity. Why could an organization composed primarily of working class persons not operate as a cohesive third party both outside and inside each of the two halves of the electoral institutions of the American State? This article describes first hand the interactions of the working class socialist political party, The Socialist Workers’ Party, (SWP) with attendees at the well publicized and well documented contending rallies in Portland Oregon in recent weeks. Mary Martin, SWP candidate for Seattle mayor, right, discusses party’s working-class program with Trump supporters, others, during protests in Portland June 4. PORTLAND, Ore. — Socialist Workers Party members spoke out against efforts by liberal Democratic Mayor Ted Wheeler to cancel a June 4 rally scheduled to support President Donald Trump as well as oppose the frenzied liberals’ campaign to drive him out of office. When Wheeler failed, Trump supporters faced anti-Trump protesters, including an anarchist “Black Bloc”-style group determined to come after them. And local cops, reinforced by state police, were out in force. Wheeler had urged the federal government to ban the event after two people were killed on a train here by Jeremy Christian, an ultra-rightist bigot, shouting anti-Muslim slurs. The two men who were killed, and another who was injured, had come to the defense of two young women targeted by Christian, one of whom was wearing a headscarf. Christian has been charged with murder. Joe Gibson, organizer of the pro-Trump rally, told participants he would eject any white supremacists. He and other speakers said Rick Best and Taliesin Myrddin Namkai-Meche, the two men who were killed on the train, were heroes. Gibson had thrown Christian out of a prior pro-Trump event. After a relatively peaceful hour of contending protests, some anarchists in black masks threw bricks at police. The cops responded by detonating flash-bang grenades, arresting 14 people and shoving people from one end of the park to the other. The cops kept up a barrage of announcements amplified to a deafening level, ordering protest participants to disperse. 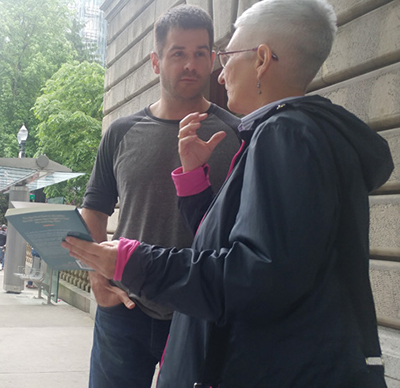 A team of Socialist Workers Party members, including myself, the SWP candidate for mayor of Seattle, set up a campaign table and introduced the party and its working-class perspective to people from both events, as well as passers-by, for over two hours. Naubert said the SWP explains that the working class is the true target of the hysteria about Trump in the liberal bourgeois media, late night “talk” shows and radical anti-Trump protests. These forces all see the working class as stupid, reactionary and dangerous. Ardith said she enjoyed the discussion and bought a copy of The Clintons’ Anti-Working-Class Record: Why Washington Fears Working People by SWP National Secretary Jack Barnes. There were a number of others like Ardith. “William Jones, wearing camouflage pants, a bulletproof vest, a T-shirt and carrying an American flag on a pole, sat along a concrete barrier in front of City Hall,” the Portland Oregonian reported, “conversing with anti-Trump protesters about whether socialism can exist in a capitalist society and whether Trump will make life better for anyone not wealthy. “Jones said he likes to keep an open mind and debate people, trying to change opinions or let others change his,” the paper reported. David Servillo, a hospital worker in Portland who is originally from France, told us he thought it would have been wrong to shut down the Trump rally as the mayor demanded. “It’s a democracy, right?” He was delighted to see the titles on revolutionary politics in French displayed on the party table. He decided to buy a subscription to the Militant and a French edition of Is Socialist Revolution in the US Possible? by SWP leader Mary-Alice Waters. There were some anti-Trump demonstrators who didn’t appreciate the SWP. At the end of the protests, SWP members packed up their materials and prepared to leave. A group of anarchists tried to get into it with Trump supporters, stacking newspaper boxes in the streets to block police. The cops started sweeping the streets and ordered people to disperse. One anarchist seeking to attack Trump people, and not looking too kindly at the SWP, grabbed our table and threw it, along with our bookrack, into the street to obstruct a cop car. Participants from the Trump rally stopped to help us recover our table and rack from the street and carry them and our literature to our car. “I’m glad to see your paper says that ‘workers are the target of the liberals’ fury,’” Miles, one of the men helping us, told me, looking at one of the headlines in the Militant. “I didn’t start out as a Trump supporter, but I couldn’t stand Clinton. Now I have friends who are liberal who won’t talk to me. Source: Karl Marx and Frederick Engels, Selected Correspondence (Progress Publishers, Moscow, 1975). Scanned and prepared for the Marxist Internet Archive by Paul Flewers. 1. The National Association was set up on 15-16 September 1859, at a conference held in Frankfurt on the Main of bourgeois liberals from the German states. Its purpose was the unification of all German states except Austria under Prussian hegemony. After the Austro-Prussian war and the creation of the North German Confederation on 11 November 1867, it disbanded itself – Progress Publishers. 2. Kölnische Zeitung – German daily newspaper published in Cologne since 1802; it was the organ of the big Rhenish bourgeoisie and the National Liberal Party; in the 1870s it was regarded as Bismarck’s mouthpiece – Progress Publishers. • World’s highest incarceration rate: US has 4.4% of world population but 22% of world’s prisoners. • Some 7 million people (1 in 35 adults) are today in federal or state prison, local jails, or on parole or probation. • 5 percent of adult males and 17 percent of adult males who are Black are or have been behind bars. • 97% of federal and 94% of state convictions in criminal cases result from the accused pleading guilty to charges horse traded by prosecutors and defendants’ lawyers. • In federal cases in 2003, defendants insisting on their right to a trial got sentences averaging nearly three times longer than those taking a “plea bargain” (12.5 years vs. 4.5 years). • More than 10 percent of US prisoners are serving life sentences, nearly a third life without parole. • Some 1 in 20 state and federal inmates are in the “hole,” solitary confinement, or other punishment cells (2005). • 2,984 people are on death row (2015). • The vast majority of those behind bars are from the working class. Some 40% are Black. • 1 in 10 men in their 30s who are Black is in jail or prison any given day.